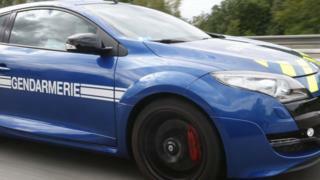 Two car thieves were arrested outside a French police station after being lured there by the officer they were chasing. On Tuesday, the officer was driving home after finishing work in Ermont, north-west of Paris, when he noticed his police car was being followed. As his pursuers attempted to ram the car, he contacted colleagues at a station in Chantilly, further north. He stopped there after a 20km (12.4 mile) chase, and the waiting officers were ready to arrest the two men. A policeman at Chantilly station told the BBC: "We just had to come out and that was it!" The two suspects, aged 24 and 29, told police they did not know the officer but wanted to steal his car, a Renault Megane. Appearing in court on Wednesday, they were convicted of attempted robbery and endangering the lives of others. They were sentenced to one year in prison, including four months suspended for the driver.